Teaching kids how to write computer code? Yes and no. You can teach kids how to think in code, and then write in code, as long as it is in a context that is easy for them to understand. 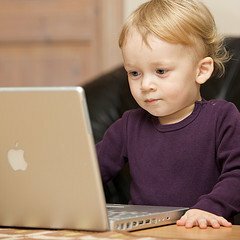 It is a process by which children learn to process and problem solve, much like is done with computer programming. Imagine a world where computer programmers begin to craft, think and write in computer languages at age 10? I think the advancements would be incredible. Developed by the MIT Media Lab, Scratch is a graphical programming language for children age 8 and up. Since its release in 2007, over one million projects have been shared on the site. Watch the video. It’s inspiring to see kids so excited about creating and building, and becoming content creators instead of content consumers. I’m downloading this for my kids, right now! In July, Google announced the launch of the Android App Inventor. App Inventor uses building blocks, of sorts, to help you design your own Android applications. App Inventor is still closed beta, but as you can see in this video, it looks very promising. It’s difficult to see how advanced App Inventor will become from this video. If they can make it as good as Scratch, I think Google will have a head start on training their future programmers! Alice is a free and open source 3D programming environment designed to teach students object-oriented and event-driven programming. In Alice, students drag and drop graphic tiles in order to animate an object and create a program. The best way to learn, is by playing. I love seeing software companies, in this case EA, taking such an interest in education. Programming Legos? Why, yes please! There are numerous other programs aimed at the K-12 level, including Small Basic, CHERP, Kodu, and of course BASIC. After I’m done installing a number of these for my kids, I think I’ll have to crack open my Notepad++ and start having some fun of my own! Thanks for the link, you are awesome.